Another month, another update. It took a while, but we’re almost there – yes, for real this time! The goal was to have everything battle-related covered before 2018, but a couple winter bugs in a row set me back a week. Nonetheless, this project’s battle engine finally has something resembling gameplay(!) attached to it, and it should be ready to show off very soon(tm). Most of late November’s checklist was ticked off of the box in December. Some headway has been made on writing the game’s guides. The battle stats have been rebalanced and are in better shape. The AI could still use a few updates in places, but it’s functional enough to work. During the holidays, my main job was to take the battle system and make sure people was making sure people have something to do with it. Do note, the images shown here are all a work-in-progress; there is still some polishing and cleaning up to do with the bot’s messages – an embed here, a typo over there, but the content is enough to give an early peek. In light of the above – random guild encounters are now live! While a Discord server is active and using the PMDiscord bot, teams of monsters will occasionally arrive and challenge the guild to a battle, usually in pairs or trios. This all happens automatically, on a specific channel named “pmdiscord-pve”. If the channel isn’t made, then the bot won’t send any auto-messages. Simple as. In this case, a lonely Bidoof stepped up to the plate. Poor thing couldn’t find a team.. Anyone can accept the challenge, and up to two teammates can help them out if they wish. With any luck, this will bring some incentive to experiment with PMDiscord’s limits and see what the most devastating strategies are. 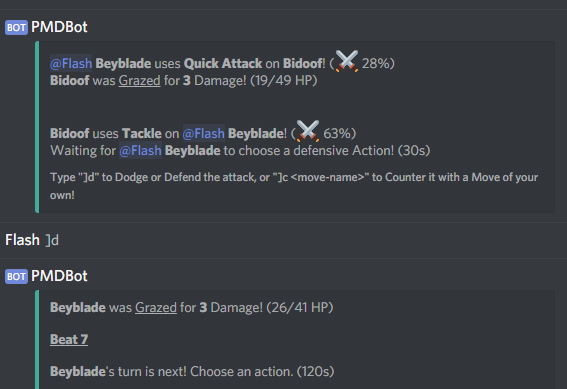 Beyblade the Hitmontop stands to meet this valiant foe. As detailed in earlier posts, combat works with asynchronous turns, but features targeting and retreating – like a mix of the main-series and Mystery Dungeon games. Between each turn, you and your teammates will have a set amount of time to plan and decide on your attacks. Bidoof prepares to think that challenging guilds wasn’t his best idea. There’s now a handful of quality-of-life commands that let you scout out your foes’ stats and positions during a battle. 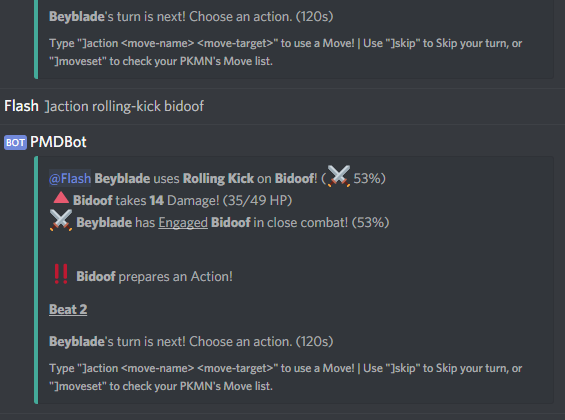 Similar commands have been made for choosing which PKMN you have active, checking through the PKMNdex and other helpful tools. Putting Discord’s embed features to good use. It could be a little prettier still. During the opponent’s turn, your team also gets a few seconds to react to incoming attacks, and choose the best method to defend against them. To his credit, Bidoof put up more of a fight than I thought he would. When a team is successful, each player will earn a few meaningless credits for their victory. If the challenging team wins, they’ll stick around for up to two rematches before going to find some other Guild to fight. I’m planning to have a few surprises in store for Guilds that manage to get a few victories in a row; we’ll just have to wait and see. A fitting reward! Larger and stronger teams will reward a few more credits each. While the game’s in a good spot now, there’s still a few things left to do from here. This week I’ve been fine-tuning the client for large server loads (just in case! ), finishing some of the game’s guides, and weeding out the last few glitches in the game itself. With that covered, all that’s left is to promote the game and get it polished for an early release! Stay tuned to find out as and when things happen.